Hey everyone - 2 more days! Eeep! I really, really, REALLY wanted to do Galaxy nails again.. But, it was going to be more challenging because I had to solely use untried polish as I have so many to go through yet.. I did it. It is kind of iffy, and I didn't get to do cleanup before going to work.. and then after work, they were pretty beat up. I do apologize for that.. Not too terrible though! It started with a base of Pure Ice Electric! (thanks Collette), then it was a sponging party with Pure Ice Jaguar (thanks again Collette! ), NYX Royal Purple (thanks Christina! ), and CG Liquid Crystal. Then I did some dots and "stars" with Orly White Out. I like them as they are different colours than I would have wanted to choose. 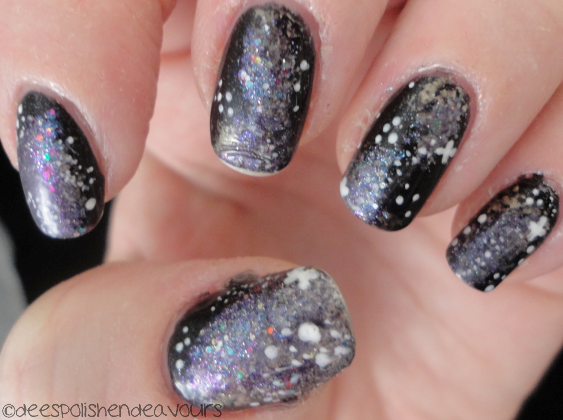 Did I mention I really like galaxy nails?